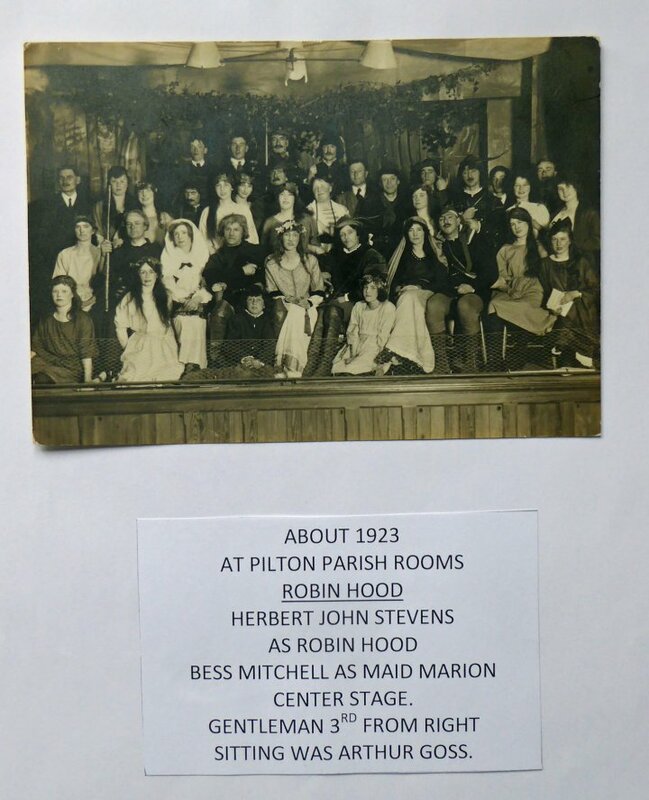 This photograph shows the cast of a musical production of ‘Robin Hood’ with Herbert John Stevens as Robin Hood and Bess Mitchell as Maid Marion on the stage of Pilton Church Hall. Herbert Stevens was reported by his son Eric John Stevens, who provided The Pilton Story with this photograph and the accompanying notes, as having a fine tenor voice. The suggestion has been made that this was a forerunner of the Barnstaple Musical Comedy & Dramatic Society which was founded in 1923. We hope that the archives of BMCDS might help in establishing the truth or otherwise of this suggestion. The Pilton Story has photographs of other musical and dramatic events in the Hall in the 1920s. Many thanks to Eric Stevens and we look forward to feedback from BMCDS.